Today: Sun and a few passing clouds. High 63F. Winds N at 10 to 20 mph. Tonight: Mostly clear. Low 38F. Winds N at 5 to 10 mph.Extended ForecastSaturday: Abundant sunshine. High 69F. Winds WNW at 10 to 15 mph. Saturday Night: Partly cloudy. Low 47F. Winds light and variable. Sunday: Intervals of clouds and sunshine. High 74F. Winds WSW at 5 to 10 mph. Sunday Night: A few clouds from time to time. Low 54F. Winds light and variable. Monday: Partly cloudy. High 78F. Winds SW at 10 to 15 mph. Rosary peas poisonous I saw this story about a man in Glades County accused of selling a toxin more deadly than ricin  and the poison apparently comes from a plant that is now growing wild in Florida. Its on the IFAS noxious weeds list and poisonous to people and livestock (if the exterior of the seed is broken) so it is now illegal to cultivate it or sell it, but since birds spread the seed its one of those ornamental plants that turned out to be an environmental nightmare.  I used to play with these as a kid, never knew they were toxic.  I wonder how many of them I swallowed as a kid. They were the ammunition of choice for pea shooters. I didnt know that they were toxic until I saw a chart in an ER. Now I keep them pulled down so that my grandkids wont get to them.  Back in the 50s we played with those things as children. Kids would harvest them, picking them out of the pods, putting them in bowls or jars for keepsakes because they were so pretty and abundant; especially abundant on the sand ridges anyway, not seeing them as much around Chobee. Ive even seen the pods with attached peas used in ower arrangements. Hmmm, sure didnt know they were that poisonous, guring they were about like playing around castor bean plants, Brazilian pepper trees, or Oleanders ... just knew not to put them in our mouth.  As for the teen in Glades County who was alledgedly selling poison online with the intent of helping his clients murder others, what kind of person does that? I am glad they caught him and I trust he will stay locked up.  So many things are potentially dangerous, but a little common sense does go a long way. For example, for years parents warned their kids not to play in drainage ditches or stormwater, and they didnt even know about the brain eating amoebas that might lurk there. They just knew it wasnt clean water so better to stay out of it. Many plants that grow in Florida are poisonous so until a kid is old enough to know better, you dont let the little ones out of sight of the supervising adult.  I was reading a link on his arrest last night, and theyve released some of the transcripts/e-mails between him and the undercover agent. YES, this guy needed arresting! He de nitely had gured out the measurement needed per pound for death, speci cally mentioning humans, and that this stuff is not usually looked for in autopsies. He sounded like a sicko and Im glad they got him off the streets ... now the task begins to see if they can keep him that way off the streets.  A person who would make and sell poison with instructions on how much to use to kill another human being has no conscience. They need to nd out just how much of the poison was sold and to whom, and add charges for conspiracy to commit murder or for being an accomplice to murder.  Heres the thing about Florida. Lots of stuff here can kill you. Weve got castor beans. Weve got oleander. Weve probably got lots more poisonous plants. Certainly there are a lot more plants that the ranchers will pull if they see them because they are harmful to livestock. Then there are the deadly snakes and spiders. Weve got mosquitoes that carry all kinds of diseases, and of course the critters like raccoons and skunks might be rabid. And weve got alligators that will go after people if they are hungry enough or if the person is stupid enough to get in harms way. Lots of stuff in Florida can kill you. But people survive here anyway. So, I wouldnt worry too much about the rosary peas. Just cut the plants down if you see them and dont let your kids run wild. YOUNIFIED is a success!What a night! YOUNIFIED 2014 was a major success and it would not have happened without many individuals, businesses, churches and organizations truly stepping out for the youth of Okeechobee County. We would like to give a BIG thank you to our corporate sponsors who played a vital part in making YOUNIFIED 2014 a success: The Pregnancy Center of Okeechobee, Childrens Services Council of Okeechobee, Seminole Tribe of Okeechobee/Pemayetv Emahakv Charter School FCA Chapter, Walpole, Inc., Okeechobee Christian Academy and American Drilling Services. We would also like to thank the following for their signi cant contributions: More 2 Life Youth, Fountain of Life Youth, First Baptist Youth, Reach FM 90.5, The Okeechobee News, The Penny Saver, CenterState Bank, Hoot Worley Construction, Williamson Cattle Company, Real Life Childrens Ranch, OHS Fellowship of Christian Athletes, Papa Johns, Serenity Coffee Shop, Teez To Pleez, Superior Water, Holiday Inn, Quail Creek Plantation, Okeechobee Music, Cindy Maynard and her kitchen crew, Davey Altman, Okeechobee County Sheriffs Of ce, Home Depot, Okeechobee The Magazine, Osceola Middle School, Okeechobee County School Board, Heartland Magazine, Shelly Sickles, Jackie Anvez, Clint and Heather Rucks, More 2 Life Set-up, Sound and Worship Teams and the countless additional volunteers who helped on the night of the event! On Saturday, Jan. 11, the Osceola Middle School gymnasium was lled with 540 6th12th graders and about 250 other children, college students and adults. This completel y free event started out with pizza, prizes and great music from local rapper D Kidd. Nex t was American Idol nalist and Christian music artist, Jason Castro. Castro was the headline musician who performed many of his current radio hits as the students crowed th e stage and sang along. After a great time of music, the mood grew more serious as nationally renowned youth speaker and author, Jeffrey Dean, too k the stage. Dean told stories that brough t both laughs and tears and held the audience captive as he challenged the students to make right choices and live for the righ t reasons. Many students made decisions to change their lives, live for God and dedicat e themselves to a life of right choices and to in uence others to do the same. For the second year in a row, Ruthie J from Reach FM 90.5 emceed the event and presented prizes. By the end of the evening, $3000 worth of prizes were given away including an iPad, laptop computer, Xbox 360, home theater systems, gaming chairs, televisions and much more!! The YOUNIFIED Executive Committe e would like to say thank you to each and every individual, business, church and organization that played a part in the success o f this years event. We could not have don e it without YOU! Most of all, we give thanks to God Almighty ... to Him be the glory! W e are already planning for next year, so let us know if YOU want to be a part of YOUNIFIED 2015! Bobby Steiert YOUNIFIED Executive Committee chairman January 24, 2014 4 Okeechobee News OPINION Public Forum/Speak Out Letters to the editor Speak Out has moved online, where i t is quicker and easier to share your i deas and converse with others. Go to w ww.newszap.com, click on the comm unity name and your local or state P ublic Forum. There, you can create n ew topics or comment on existing t opics. What follows is a sam pling of s ome of the discussions currently taki ng place. Thanks for participating! Okeechobee Forecast CorrectionThe Wednesday, Jan. 22 edition of this newspaper contained an unfortunate error on the Obituary page. Due to a computer glitch, the obituary for Geneva Merriman was published with the photo of Beverly Lloyd Wilson. We apologize to the families of Beverly Lloyd Wilson and Geneva Merriman for the error and for any confusion, distress or inconvenience it may have caused. Both of the obituaries are published in todays paper on page 6. 2 Serving the communities south of Lake Okeechobee May 27, 2010 Obituaries should be submitted to t he Okeechobee News by e-mailing o bits@newszap.com. Customers may also r equest photos and links to online guest b ooks. A link to the obituaries is available at w ww.newszap.com.Beverly Lloyd Wilson OKEECHOBEE  Beverly Lloyd Wilson of Boca Raton, Fla., died Wednesday, Dec. 25, 2013 at home surrounded by her loving family. Beverly was born Dec. 13 in Alliance, Ohio to Issac and Freda Lloyd. She moved to South Florida in 1952 with her husband and children and entered into a long career in hospitality and property management. After retiring in 2005, Beverly stayed active, loving to dance and visit with friends and family. Beverly is survived by her two sons, Billy (Debbie) Wilson and Bruce (Kim) Wilson; two daughters, Becky Wilson and Bonita Wilson Green; nine grandchildren; and four greatgrandchildren. She was preceded in death by her husband, William A. Wilson; and her sisters, Doris Honchell and Marvel Stratman. A memorial service will be held at 3 p.m. on Sunday, Feb. 2, 2014 at St. Paul Lutheran Church in Boca Raton, FL. Efrain Billy Ochoa, Sr., 70Efrain Billy Ochoa, Sr. of Okeechobee died Jan. 22, 2014. He was born Sept. 12, 1943 in Mercedes, Texas to Erasto and Teresa Venezuala Ochoa. He came to Okeechobee about 60 years ago. He was of the Catholic faith and enjoyed shing, visiting with friends and going to the ea markets. He was preceded in death by his two sons, Eddie and Edward Ochoa; and daughter, Emma Lee Ochoa. He is survived by his wife, Hortencia Ochoa of Okeechobee; two sons, Efrain Ochoa, Jr. (Deann) of Georgia and Keith Billie (Margie) of Okeechobee; daughter, Erica Marie Ochoa of Texas; 15 grandchildren; 12 great-grandchildren; two brothers, Gary Ochoa (Pauline) and Elmer Ochoa (Diane) of Okeechobee; four sisters, Elma Ochoa of Delray Beach, Elia Juanita Ochoa, Elda Gancerez (Armando) and Estella Ochoa all of Okeechobee. Visitation will be 10 a.m. until services at 11 a.m. Monday, Jan. 27, 2014 at Buxton & Bass Okeechobee Funeral Home. Those wishing to leave a message of condolence may sign the register book at, www.OkeechobeeFuneralHome.com All arrangements are entrusted to the direction and care of the Buxton, Bass and Conway families of the Buxton & Bass Okeechobee Funeral Home, 400 North Parrott Avenue, Okeechobee, Florida, 34972Deloris Marie Beeman Propps, 86Okeechobee  Deloris Marie Beeman Propps, wife of James Hilbert Abe for six years, peacefully passed away in her sleep at their home in Okeechobee on Jan. 20, 2014. She was born in Anderson, IN to the late Raymond and Myrtle Haines Beeman. She was a graduate of Pendleton High School. Deloris was baptized on the 21st day of May 1960 at East Lynn Christian Church. She retired from the Federal Deposit Insurance Corporation where she had served as a real estate analyst in Oklahoma, Dallas, New York City and Connecticut. She was a member of the Elks Lodge #2871 in Okeechobee. Deloris is survived by her four children, Sherie Kendall, David Kendall (Danese Sloan), Barton Kendall (Marcia) and Linda Bender; grandchildren, Karen Marcus, Owen Long, Bryan Kendall (Mary), Justin Kendall, Katherine Meixell (Chris), Addison Bender; six great-grandchildren. Her brother, Curtis Beeman, preceded her in death. His three daughters, Carole Ann Coan, Janet Anderson and Susan Lambert (Tom) survive their Auntie Deloris. Abe will hold a memorial reception from 11 a.m. until 12 p.m. Saturday, Jan. 25, 2014 at Buxton & Bass Okeechobee Funeral Home to celebrate her life. The nal resting place will be in Maplewood Cemetery, Anderson, Ind. In lieu of owers, memorial donations may be made in Deloris name to the St. Josephs Indian School, PO Box 300, Chamberlain, SD 57325. Those wishing to leave a message of condolence may sign the register book at, www.OkeechobeeFuneralHome.com All arrangements are entrusted to the direction and care of the Buxton, Bass and Conway families of the Buxton & Bass Okeechobee Funeral Home, 400 North Parrott Avenue, Okeechobee, Florida, 34972 Geneva Merriman, 74OKEECHOBEE  Geneva Merriman died Jan. 19, 2014. She was born December 18, 1939 in Portageville, Mo. to Walter and Daisey Hall. She was a homemaker and enjoyed playing the slots at the casino, cooking for her family especially pies, and helping others. She was a resident of Okeechobee for 40 years. Ms. Merriman was preceded in death by two grandsons; two brothers, Dallas and Joe Hall; sister, Joy Carnell; the father of her children, Lawrence Merriman; and companion, James Cloinger. She is survived by her two sons, Danny Merriman (Lisa) of Elizabethtown, N.C. and Bobb y Merriman (Nancy) of McAlpin, Fla.; two daughters, Janine Merriman (Jim) and Vicki Goggans (Walter) of Okeechobee; stepson, Brian Cloinger of Ocala; 16 grandchildren; six great-grandchildren; three brothers, Robert Hall (Sue) o f Fellsmere, Fla., Jimmy Hall of Port St. Lucie, Fla. and Michael Hall (Brenda) of McAlpin, Fla.; three sisters, Pat Carr of Ft. Pierce, Barbara Erts (Barry) of Colorado and Dottie Coker of Ft. Pierce; and companion, Carl Kangieser of Okeechobee. Visitation will be from 5 to 7 p.m. on Thursday, Jan. 23, 2014 at Buxton & Bass Okeechobee Funeral Home. Funeral services will be at 10 a.m. on Friday, Jan. 24, 2014 at Buxton & Bass Okeechobee Funeral Home with Father Sean Mulcahy of Sacred Heart Catholic Church of ciating. Interment will follow at Evergreen Cemetery. In lieu of owers, memorial contributions ma y be made to Hospice of Okeechobee, PO Box 1548, Okeechobee, FL 34973. Those wishing to leave a message of condolence may sign the register book at, www.OkeechobeeFuneralHome.com All arrangements are entrusted to the direction and care of the Buxton, Bass and Conway families of the Buxton & Bass Okeechobee Funeral Home, 400 North Parrott Avenue, Okeechobee, Florida, 34972 MOVIE TICKETS:Adults $6.50 Children 12 & under $5.00 Senior Citizens $5.00 all movies Matinees $4.50Fri., Jan. 24TH Thurs., Jan. 30THFor Info, Call 763-7202 II:  THE NUT JOBFri., Tues. & Thurs. 7:00 & 9:00, Sat., Sun. & Wed. 2:00, 4:15, 7:00 & 9:00, Mon 3:00 & 7:00I: I, FRANKENSTEINFri., Tues. & Thurs. 7:00 & 9:00, Sat., Sun. & Wed. 2:00, 4:15, 7:00 & 9:00, Mon 3:00 & 7:00III: JACK RYAN: SHADOW RECRUITFri., Tues. & Thurs. 7:00 & 9:00, Sat., Sun. & Wed. 2:00, 4:15, 7:00 & 9:00, Mon 3:00 & 7:00 PG-13 PG PG-13 Obituaries 6 Okeechobee News January 24, 2014 The Okeechobee County Division of Emergency Management announced Thursday they will be using a new communications service which will notify residents when a potential disaster or other event threatens our community. Nixle Connect allows Emergency Management of cials to create and publish messages to be delivered to residents who subscribe instantly via cell phone text message and/or email. Noti cations can also be accessed online at Nixles web site at w ww.nixle.com. The basic service is prov ided by Nixle to public safety agencies at no cost. With so many residents now using their cell phone as their primary phone and communication device, (i.e. internet, social media etc ...) it has been a challenge at times, to get emergency information to residents in a timely enough fashion so they can take action to protect their home and family. said Director of Emergency Management, Mitch Smeykal. This product is our rst step in the process of lling that information gap. Citizen registration and use is also free of charge. Communications can range from emergency alerts to routine day-to-day information (weather alerts, disaster safety tips, shelter information, community outreach programs and general civic affairs). Currently, more than 4,600 public safety agencies around the nation have adopted Nixle for their means of real-time communications with residents, and over 660,000 citizens have signed up to take advantage of the services. Members of the public can register for Nixle Connect by texting their zip code to 888777 or visiting www.nixle.com. You can also contact Mitch Smeykal, Okeechobee County Division of Emergency Management 863-763-3212 for more information. Emergency of ce adds new warning system Community group to meetThe Community Collaborative Council of the Okeechobee County Shared Services Network will hold their monthly meeting Tuesday, Jan. 28 at 10 a.m. in the board room of the Okeechobee County School Board of ce. January special guest speakers will be: Rebecca Barnes, Action Home Health, and Rossana Gonzalez from New Horizons. The purpose of the meeting is to allow the community to identify issues, collaborate, and share information regarding services for children and their families. The meeting is open to the public and everyone is welcome. For information, call Sharon Vinson at 863-462-5000, ext. 257. 2 Serving the communities south of Lake Okeechobee May 27, 2010 772.461.6000 TOLL FREE 877-251-FORD (3673) SOME VEHICLE PHOTOS ARE APPROXIMATE LIKENESS TO THE IN STOCK INVENTORY. *0% APR for 60 months through Ford Motor Credit WAC plus tax, tag title and $289 dealer fee. PRICES MAY REQUIRE TRADE ASSIST AND INCLUDE ALL REBATES PLUS TAX, TAG, TITLE AND $289 DEALER FEE.New vehicles priced accurately at time advertisement on press. All new vehicle payment info is based on 36 month lease with 10, 500 miles per year. Includes lease conquest PLUS tax, tag, title & dealer fees. Pre-owned vehicle payment info is based on $2,0 00 down, 66 months with approved credit.YOUR INTERNET REPRESENTATIVE MARK GALLAGHER MON. men South Florida Af liate, they only serve patients in Martin, St. Lucie and Palm Beach counties. She said her af liate "does not have the wherewithal" to cover Okeechobee County. Even though there are six Susan G. Komen af liates in Florida, Ms. Gabbard said there is a lack of coverage throughout Florida even though there is an increasing need. "One of our long-term objectives is how may we expand to the likes of Indian River and Okeechobee counties," she said in a phone interview. "We recognize there are gaps in coverage. But there are a lot of uncovered counties in the state of Florida, particularly in the Panhandle." Despite the fact that the af liate does not help local breast cancer patients, Ms. Gabbard said they do receive and accept donations from Okeechobee County. Meieli Sawyer, who is with The Weinbach Group in Miami which handles media requests and such for Komen South Florida, said in an e-mail that there are about 178 constituents in Okeechobee County, and 25 w ho have a records of lifetime giving to the af liate. Ms. Gabbard pointed out that while her af liate may not help local patients with their bills, they do lobby state legislators on behalf of all cancer patients. And because of those efforts, Governor Rick Scott has signed a law requiring health insurance companies to cover the cost of oral cancer drugs the same way they cover the cost of IV or injectable drugs. For breast cancer patients, this law means access to medication that is often more effective and has fewer side effects. Mrs. Hans, whose husband Chris is a deputy with the Okeechobee County Sheriff's Of ce (OCSO), said local bene ts on her behalf helped her immensely as did the sheriff's of ce. One local fundraiser took in enough money to partially pay for her surgery. She said she's also had some very compassionate doctors. "I don't know if I just lucked out, but I've got some really good ones. The doctors are w illing to work with us," she said. "The sheriff's of ce paid for my biopsy, and Raulerson Hospital has been phenomenal, as far as w orking with me." For Mrs. Wallace, her insurance has been there when she needed it as well as her employer and her husband, Mike. "It's been horrible. Thank God for my husband, who has been a great supporter, and a very understanding employer," she said. Mrs. Wallace works for the Highlands County Board of County Commissioners. "I'm done with the cancer. It's the reconstruction that's been a booger for me. But, that's OK. It's a work in progress," said Mrs. Wallace, who her husband describes as a ghter. And while waiting in a hospital room at Martin Memorial Hospital last summer for his wife to undergo yet another procedure, Mike decided to do some doodling. He drew a running ribbon, put boxing gloves on each hand then wrote inside the ribbon: "This girl's a ghter." From there, he didn't think much more about it until some friends were at the Wallace home one evening and one asked if he could take Mike's drawing and have a graphics artist x it up so he could give it to Sharon. Mike willingly gave him the go-ahead. One thing led to another and the nowcolorful and clever rendition of Mike's original drawing graced the inside of a magazine, along with an article about Sharon's efforts to raise money by painting local re hydrants pink. Because of her efforts $1,800 has been raised and another $850 has been pledged. Sharon said that money will be distributed locally to Martha's House, Hospice and Heroes 4 Hope. In the meantime, the couple decided to get their drawing trademarked. "I really didn't have any plans," said Sharon. "All I've done is made some shirts and I've been giving them to people. There are people on Facebook who have tried to take it." Eventually the South Florida af liate found out about the efforts to trademark Mike's drawing and, on Jan. 15, the Wallaces received a letter from the foundation's attorneys in Dallas. That letter tells the couple that a notice of opposition to their drawing will be led and states they should sign a coexistence agreement with Komen. The letter also states the Wallace's "Ribbon Device is not to be used in a way likely to cause confusion with Komen's Running Ribbon Design, nor, in any other way, that would weaken or dilute our client's rights." At this point, the Wallace's have not decided what to do, but they are going to have to nd an attorney. It should also be noted that Mike's drawing was posted in the Trademark Of cial Gazette on Dec. 3, 2013. If someone opposes the drawing being trademarked, they have 30 days in which to do so. The letter from Komen's attorneys asks the court for a 30-day extension to give them time to oppose the potential trademark. "When I got the letter, I didn't understand, rst of all, what a coexistence agreement was and how it could challenge my drawing that's so different than theirs," said Sharon. "It seemed crazy to me something that big (Komen) would take over something so small. "The logo (Mike's drawing) was so personal. It was beautiful and it surprised me. I haven't responded (to the Komen letter) yet. They can certainly afford to ght me a lot more than I can afford to ght them," she added. Though she isn't sure just what can be done, Sharon says something has to be done locally to help cancer patients. "What I wanted to do for all those lives I've touched and have touched me, was to do something local. I can't imagine how I was ever so blind as to how many people, locally, are affected by this," Sharon said. "I don't know how to get help to Okeechobee, but it's needed." 2 Serving the communities south of Lake Okeechobee May 27, 2010 10 Okeechobee News January 24, 2014 A RTContinued From Page 1 Okeechobee News/ Eric KoppSharon Wallace (seated) has successfully battled against breast cancer, and now she and her husband Mike (standing) must decide if they want to battle the Susan G. Komen Foundation over the drawing held by Sharon. 5:00 p.m. Friday 8:00 a.m.
4:00 p.m.(863) 467-2159 Dr. Zynab HassanBoard Certied by the American Board of Family PhysiciansFamily Physician  Pediatrics Physicals  Family Care & Medicine Womens Health  Well-child visits Welcome to Medicare visits RADIATION ONCOLOGISTS W hen you are sick or need to see a doctor, you likely do not feel or act like your normal healthy self. Whether you Having a Primary Care Provider is important, even if you are healthyare experiencing fatigue, dizziness, nausea, or a host of other symptoms, your ability to thoroughly communicate about your condition and comprehend the doctors medical advice may be compromised. This is just one reason why it is bene cial to have an existing relationship with a Primary Care Provider, before you actually need one. Another bene t to having an existing relationship with a Primary Care Provider is having a baseline point of reference for your physical health (for example your weight, cholesterol & blood pressure). This knowledge, as well as you and your familys medical history, can help promote an accurate diagnosis and help proactively monitor patients risk factors. Generally a patients overall comfort level and con dence in their physician is increased when the patient has an existing relationship with the physician. With this increased con dence, comes trust. When patients know and trust their physician (vs. meeting the physician for the  rst time when they are sick or need healthcare) patients can more easily and openly communicate ALL of their health and wellness concerns. Certainly patient outcomes bene t when physicians have the whole picture of their patients health. One of the reasons people give for not proactively seeing a doctor is their lack of time. If you think you are too busy to have your cholesterol levels checked, just imagine how your schedule will be affected if you suffer a heart attack? Another reason people give for not visiting a doctor annually is that they are worried about what the doctor, lab results or a screening may reveal. Ignorance is not bliss, when it comes to your health. Studies have shown that early detection and treatment are critical to a successful outcome, whether the diagnosis is breast cancer, diabetes or heart disease. A very popular reason for many people to avoid scheduling a wellness visit is uncertainty regarding the cost and how to pay for the visit. Yet, man y insurances, as well as Medicare, often include an annual wellness visit in their bene ts. Contact your insurance provider to learn if annual wellness visits are included in your health plan. If you have a healthcare question o r need help  nding a doctor, Raulerson Hospital provides a free 24/7 ConsultA-Nurse hotline: 863-763-9228 CANCER worrying you?Do you need to talk about it?Big Lake Cancer Center1115 NorthParrott Ave  OkeechobeeRamesh Kumar, MD  William Crook, MD  Julie Santelli, MD, BoardCertified Radiation Oncologists Call: 863.467.9500 FREE Hour Counseling Session 12 Okeechobee News January 24, 2014 Special to the Okeechobee NewsTaylor Creek Bass Club held the first tournament of the year on Saturday, Jan. 11, on Lake Okeechobee. Following the cold front, fishing was great, but the catching was tough for most. The team of Byron Chastain and Scott W ise brought in a total of 18.89 lbs. to the scales for the win. Runner-up spot w as Vicky Brackin and John Schoonmaker with total weight of 9.90 lbs. Frank Boyer and Larry Harris finished in third place with total weight of 8.09 lbs. They also won the Big Bass award w ith a fish weighing 6.84 lbs. The Taylor Creek Bass Club meets at the Buckhead Ridge VFW Post 9528 on the second Thursday of each month. Tournaments are held the following weekend. New boaters and (especially) nonboaters are welcome. For information, call Keith Jones at 518-423-8262, or Vicky Brackin at 863-528-2027. Normal tournaments will be Draw Team Tournaments with points earned individually for Fisherman Of The Year and monetary awards earned as a team. The Classic Championship tournament is held in December. Chastain and Wise win TC club bass tournament Special to the Okeechobee NewsByron Chastain (left) and Scott Wise took rst place with a total weight of 19.89 lbs. Special to the Okeechobee NewsVicky Brackin (left) and John Schoonmaker took second place with a total weight of 9.90 lbs. 2 Serving the communities south of Lake Okeechobee May 27, 2010 For more information, contact 863.763.3134 or email  bizsearch@newszap.com ORTHOPAEDICS Benjamin Epstein, D.O.Dr. Epstein is an experienced orthopaedic surgeon, who has been in practice for 20 years. Dr. Epstein For more information or to schedule an appointment, call 863-357-0540. Most insurances and Medicare are accepted. We Treat Kids Too!Great Orthopaedic CareRight Here in OkeechobeeOrthopaedic Specialists at Raulerson offers a full range of orthopaedic services including:  Total Hip and Knee Replacements  Arthroscopic Surgery & Sports Medicine  Pediatric Orthopedics  Work Related injuries 13 Okeechobee News January 24, 2014 By Charles M. MurphyOkeechobee News Bethany Stuart led a trio of players in double gures with 14 points as Okeechobee High School walloped out matched Glades Day School, 52-7, in girls high school basketball action Wednesday night at OHS. Cheyenne Nunez had 13 points and Taylor Trent had 11 points for Okeechobee. Hailey Greeson had a strong game with six points, ve rebounds, three steals and six assists for the Lady Brahmans. Okeechobee played strong in all aspects of the game. They played hard defense and came up with a lot of steals and loose balls, dominated the rebounds, and totally shut down Glades Day's offense. The Lady Gators (2-12) have lost three times this year to OHS, once in the preseason classic, and during December in Belle Glade. They have no juniors or seniors on their team. Okeechobee used the entire bench in this game and got contributions from all of their players. Sha Dasia Williams had ve steals and ve rebounds, Thadd Sanders had four steals and two assists. LaPorsche Morris had three steals and three rebounds. Alexus James grabbed three rebounds and had three steals. Martina Herraro had four rebounds, four points and two steals. OHS coach Morgan Ungerott was pleased with the balanced scoring of her team. "We need Taylor, Bethany and Cheyenne to score. When we get some three point baskets early in the game we usually win," said the coach. Ungerott said the team had an inside and outside presence, got some fast breaks and made some layups. She called it a "good team win" for the Lady Brahmans. Trent said she has been bothered a bit by a shooting slump in recent games. She said she gained con dence when she was able to hit a few jumpshots. "It felt good. I've been off with my shooting for the last ve games and it felt good to be back on track," she explained. Okeechobee led 18-2 after the rst quarter and held a 32-6 lead at the half. Okeechobee led 44-7 after the third quarter. Ungerott said she was glad the team has built some momentum late in the season and she said they are playing their best basketball of the season, "We put ourselves in a tough position as the number ve seed at districts but we are headed in the right direction. I like that morale is up, we've gotten good team play and I really can't complain." Trent said she felt blow out wins can be hard to play because sometimes you can lose your focus and sense of urgency, "In the beginning you don't think about it but when you get a lead, you start to relax and say to yourself, what not let them get some points too." The Lady Brahmans open their district tournament on Monday night at Jensen Beach High School against Port St. Lucie. Lady Brahmans pummel Glades Day, 52-7 Okeechobee News/ Charles MurphyTaylor Trent (in white) passes to an open teammate as Gabriela Tellechea defends during Wednesdays game at OHS. The following individuals were arrested on felony or driving under the in uence (DUI) charges by the Okeechobee County Sheriff's Of ce (OCSO), the Okeechobee City Police Department (OCPD), the Florida Highw ay Patrol (FHP), the Florida Fish and W ildlife Conservation Commission (FWC) or the Department of Corrections (DOC).  Ciarra Paige McCullough, 19, N.E. Fifth St., Okeechobee, was arrested Jan. 20 by Deputy Cari Arnold on an Okeechobee County warrant charging her with the felony of accessory after the fact (burglary of a dwelling while armed). Her bond was set at $85,000.  Jean Marie Gamble, 49, N.E. 78th Way, Okeechobee, was arrested Jan. 20 by Deputy Steven Pollock on a misdemeanor charge of driving under the in uence. Her bond was set at $1,000.  Linda Mae Carnley, 29, N.W. Second St., Okeechobee, was arrested Jan. 21 by the Okeechobee Narcotics Task Force on an Okeechobee County warrant charging her w ith the felony of possession of a controlled substance (cocaine) and a misdemeanor charge of possession of drug paraphernalia. Her bond was set at $6,000.  Gary Aunspaugh, 54, U.S. 441 S.E., Okeechobee, was arrested June 21 by Deputy Megan Holroyd on an Okeechobee County warrant charging him with the felony of boating under the in uence. His bond was set at $25,000.  Laura Harmon Lee, 49, S.E. 40th Ave., Okeechobee, was arrested Jan. 22 by Deputy Steven Pollock on a misdemeanor charge of driving under the in uence. She was released on her own recognizance.  Roland Clifton Long, 40, Perimeter Road, Clewiston, was arrested Jan. 22 by Deputy Fred Bradley on an Okeechobee County warrant charging him with the felony of conspiracy to manufacture methamphetamine. His bond was set at $10,000.  Lisa Osceola, 48, N. Arbalena, Clewiston, was arrested Jan. 22 by Deputy Fred Bradley on Okeechobee County warrants charging her with the felonies of possession of methamphetamine with intent to sell and conspiracy to manufacture methamphetamine. Her bond was set at $20,000.  Edwin Troy Harper, 23, N.E. Eighth St., Okeechobee, was arrested Jan. 22 by Trooper T.D. Burk on a felony charge of driving while license suspended habitual offender. His bond was set at $500.  Joseph Nelson Rickey, 27, Brinkerhoff Lane, Okeechobee, was arrested Jan. 22 by Deputy Corporal Aric Majere on a DOC warrant charging him with the felonies of violation of probation giving false information to a pawnbroker (four counts) and violation of probation traf cking in stolen property (two counts). He is being held without bond.  Dylan Colby Garcia, 21, N.W. Sixth St., Okeechobee, was arrested Jan. 22 by Deputy Cpl. Aric Majere on a DOC warrant charging him with the felonies of violation of probation burglary of an unoccupied structure and violation of probation grand theft. He is being held without bond. This column lists arrests and not convictions, unless otherwise stated. Anyone listed here who is later found innocent or has had the charges against them dropped is welcome to inform this newspaper. The information will be con rmed and printed. Okeechobee Arrest Report 2 Serving the communities south of Lake Okeechobee May 27, 2010 REHAB THERAPY/ NURSING HOME We Love to We Love to Care! Care! Okeechobee Okeechobee Health Care Facility Health Care Facility1646 U.S. Highway 441 North 863-763-2226Five-Star Rated Family-Owned &Operated, OHCF has been Providing Rehab & Residential Care to Okeechobee & the Surrounding Communities Since 1984Rehab, Physical, Occupational, Speech and Out-Patient Therapy Long-Term Nursing Care Available 7 Days a Week/24 Hours a Day Secure Dementia and Alzheimers Memory-Care Wing Delicious Dietitian-Planned MealsStimulating &Fun Daily Activities OPHTHALMOLOGY/ OPTOMETRY/OPTICAL 520 S.Parrott Ave.  Okeechobee Website:www.opticalgalleryeyecare.comOptical Gallery 763-4334763-3403 357-4899Medicare/Medicaid and Most VisionPlans Accepted Comprehensive Eye and Contact Lens Exams Advanced Cataract Microsurgery Diabetic Eye Exams Glaucoma Evaluation & Treatment State of the Art Complete Optical Laboratory Eyeglasses & Contact Lenses Richard L. Soldinger, O.D. David J. Underill, O.D. Board Certified Optometrists Silviano Matamoros, M.D. Board Certified Eye Physician & Surgeon UROLOGY DAVID A. SIGALOW, M.D.Board Certi ed In UrologySpecializing in:  Adult & Pediatric Urology  Bladder & Kidney Infections  Impotence/Implants  No Scalpel Vasectomy 215 N.E. 19th Dr.  Okeechobee 863-763-0217 Available Now!The 2013  2014 Medical Information Guidespecialsections.newszap.com Lordy, Lordy Keith Bourgault is 40 !!!!!!! From all of your family!!! We love you!!! 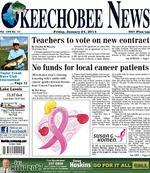 14 Okeechobee News January 24, 2014 Church hosts potluck dinnerA Christian singles potluck dinner will be held Friday, Jan. 31, at 6 p.m. at The Gathering, 1735 S.W. 24th Ave. Please use the south door. For information, call Mollie at 863-763-9626. By Charles M. MurphyOkeechobee NewsThe school board approved improvement plans for Okeechobee High School, the Okeechobee Achievement Academy and the Freshman Campus, recognized senior members of their award winning high school band, and handled other business matters at their rst meeting of 2014 on Tuesday. Principals Randy Weigum, Carol Revels, and Toni Wiersma presented plans to improve their schools to the school board that includes some lofty goals for this year. Mr. Weigum reported budget cuts have eliminated prevention programs at OAA. It w as reported that 77 percent of students qualify for free or reduced lunch. ESE population is up to 45 percent this semester. Thirty-nine percent of the students have been retained for one year. FCAT trends in level 1 and 2 reading continue to grow. It was reported that 63 percent of students are at the lowest level in math. None of the students have been able to pass FCAT writing. Suspensions and expulsions are down signi cantly, only 1.2 percent of students were expelled during the rst semester. They have emphasized improved study skills and improved note taking in class. In reading tests OAA has been above the state average of other alternative schools. Fifty percent made reading gains. Forty- ve percent of kids made learning gains in math. OAA received an overall maintaining school rating. That is the rst time in the school's history they earned this rating and placed them in the top 32 percent of the state in alternative schools. Mentoring, improved software programs, higher expectations from teachers and higher expectations from students are the key to these improvements. The school works with Communities in Schools, New Horizons, Okeechobee Castle and Workforce Solutions to provide programs for students that include job training, mentoring, counseling, drug intervention and the Red Ribbon week to promote reading. Superintendent of Schools Ken Kenworthy applauded the work Mr. Weigum has done. Mrs. Revels, principal of the Freshman Campus, said retained ninth graders have been added to the student body this year for the rst time. The campus earned a B grade last year. Fifty percent of students were at grade level in reading, the best it has ever done. Nineteen percent of students scored level one in reading. The campus met state averages in algebra, 52 percent. Ninety-four percent reached grade level in geometry, well over the state average. Thirteen percent scored level one in algebra, better than the state. No student scored level one in geometry. Seventy-nine percent of students were at grade level or above in biology. Twelve of 18 students scored level 3 or above, state average on the AP Human Geography class, or 67 percent. The global average on this test was only 52 percent. The campus has started a writing program to assist writing scores at the high school. Mrs. Wiersma said OHS has a lot of work to do but are focused on improvement in reading, math, geometry, writing, graduation rate, and having more kids that are college ready in reading and math. Tougher writing standards led to reduced scores this year. The students didn't give enough supporting details in their writing according to the state. Fifty percent of students were at satisfactory or higher in reading which was a gain of nine points, 35 percent in math was a gain of two points, 45 percent in writing down from 81 percent in 2011-2012, and 27 percent in science. Sixty-six percent made reading gains, the highest rate ever at OHS. Fifty-one percent of students made learning gains in math. Sixty- ve percent of the lowestperforming students made improvement in reading. Fifty-four percent of low-performing students made gains in math. According to the report, 45 percent of students take part in dual enrollment, and 99 percent of students had grades of C or better in those dual enrollment courses. The four-year graduation rate stood at 72 percent, an improvement from 69 percent last year. The report also showed that 53 percent of students considered at risk graduated within four years and 46 percent of students graduated within ve years. Seventy percent of students were considered college ready in reading. Fifty-nine percent were college ready in math despite tougher standards. The high school earned a C grade for 2012-2013. In business actions, the board expelled an eighth grade student at OAA for de ance of authority. They also adopted a proclamation that recognizes January as National Mentoring Month. Of cials with the Big Brothers Big Sisters organization were on hand to accept the proclamation. The board appointed Donna Garcia as coordinator of Staff Development at the District Of ce and named Jody Hays as assistant principal at Osceola Middle School, effective Feb. 3. The board approved the employment of Eric Kindell as head varsity baseball coach at OHS. They accepted the retirement notice of Central Elementary principal Randy Paulson, who retires effective July 1. Kyle Abney, representative of the Generation Green Program, spoke about the impacts of the program designed to recognize and honor outstanding individuals and schools in the Treasure Coast that are committed to green education and innovation. He recognized Rachel Jones, who won an award as an Okeechobee teacher last year. He asked the board to endorse the program, promote it, and encourage principals, students and teachers to take part. Nominations are now available for annual awards. Theresa Chandler of Waste Management said Central Elementary has been active in recycling and are a great example of a green school. "It is a wonderful program and it is our future. It is a great program." The awards are held at Citrus Grove Elementary in Palm City during April. Nineteen seniors of the Okeechobee High School band were honored for four years of participation with the band. Superintendent Kenworthy praised the kids for their dedication to the band. He mentioned the trip taken to Washington, D.C. last spring as a memory they will not soon forget. Twenty- ve of the students in the band will participate in the All County Band Concert this weekend at Indian River State College in Ft. Pierce. Four Okeechobee students will participate in the All County Jazz band concert. The board honored Rachel Jones of Central Elementary School who earned this quarter's Golden Mouse Award for the use of technology in her classroom. The lunchroom at Central Elementary School was also recognized for their contributions to student health and nutrition. The board also accepted the resignation of Anthony Calzadilla, the OHS wrestling coach. Alvina Robertson, secretary of Staff Devel-opment, was honored upon her retirement. She worked 27 years for the school system. The board scheduled a special meeting for Friday, Feb. 7, at 8:30 a.m. to take a tour of Okeechobee High School. The board plans future visits to other campuses including Everglades Elementary School and Osceola Middle School. Mr. Kenworthy also reported the board received an internal audit that contained no material weaknesses. He also reported that student enrollment is projected to be down 147 students next year, an estimate of 6,079 students. That projects in a loss of revenue of close to $600,000 next year. The annual recognition banquet for school employees will be held on Saturday, Feb. 15, at Osceola Middle School. School board member David Williams announced he would not seek a sixth term to the school board this year. He said he ran at age 30 on the platform that he had a vested interest in the school system as he had children in school. He said it was a very tough decision but he has high hopes he will be replaced by a quali ed person who may be more active. "I just wanted to make the announcement I would not run for re-election and I wanted to come out early and give candidates a chance to qualify, come to some meetings and see what it is all about," he explained. Mr. Williams emphasized he loves Okeechobee and appreciated the support and con dence the community had in him during his 20 years on the board. "I was very fortunate to work with some very good superintendents. The schools have very little debt, all the schools are paid for, we've been through some hard times but I think we're headed in the right direction," he explained. Mr. Williams said he has no other political plans at this time. 2 Serving the communities south of Lake Okeechobee May 27, 2010 Seventh AnnualSaturday, January 25  9am 2pmAgri Civic Center  4601 Hwy 710  OkeechobeeSponsored in part by: Childrens Services Council of Okeechobee, Raulerson Hospital, Florida Community Health Centers, Inc., Tobacco Free Partnership of Okeechobee County, Health Council of Southeast Florida, Nurse On Call, Lake Okeechobee Rural Health Network, Inc., Florida KidCare, State Farm, Heartland Discount Pharmacy, Florida Health Department Okeechobee County, WellCare and Okeechobee County.OKEECHOBEE FAMILY HEALTH AND SAFETY EXPO Over 120 vendor booths! FREE Health Screenings! FREE Giveaways! Entertainment! FREE Food! Fun! Family! A special appearance by Ronald McDonald If you have questions or need additional information, please contactSharon Vinson, 863.462.5000 ext. 257 Donny Arnold, 863.634.6464 19 Okeechobee News January 24, 2014 School board approves school improvement plans Okeechobee News/ Charles MurphyJames Edward Bell, a sophomore at OHS, was honored as he became an Eagle Scout at the Jan. 21 meeting of the Okeechobee County School Board. Superintendent of Schools Ken Kenworthy presented the honor.